25 May 2008 – Goondiwindi to Roma « Travelling in an RV called "Blue Snoopy"
The alarm went off at 6.00am and we elected to make the effort of getting up with the intention of an early departure. We left the caravan park just after 7.30am heading north on the Leichhardt Highway heading first through Moonie (this was the site of Australia’s first oil field) where we stopped for coffee and a snack, then on to Miles where we turned left towards Roma. After four days of travel, we are yet to pass through any outstanding scenery. The countryside appears to be very dry and this is emphasised more with a high amount of road kill. We cannot recall ever seeing so many dead Kangaroos as we did today. We also saw one live kangaroo and several emus on the side of the road and fortunately they all stayed put. We went very close to hitting several birds that actually flew directly towards the van as they departed the road kill they were feasting on. We still don’t know how they (we) missed. We arrived at Roma just before 1.00pm (not happy with the fuel consumption today!) after really taking it fairly carefully as far as speed went. We checked into the Big 4 caravan park where we have an ensuite. “She” will be happy having a bathroom all to herself that is far larger than the motorhome. 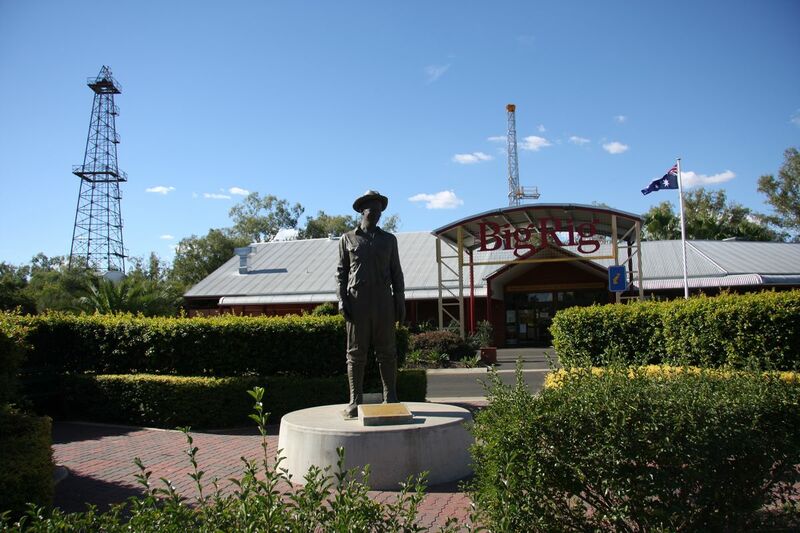 We visited a local attraction called the ”Big Rig”, a tourist attraction built to celebrate the exploration of Queensland Natural Gas production. For the first time ever, we received “senior” pricing with the entry ticket. There was nothing open in Roma so after a quick drive around town which included a photograph of the “School of Arts Hotel” (not sure if this is the one that is celebrated in song by Slim Dusty), we returned to the caravan park at 4.00pm where the satellite dish was once again successfully erected (go the Tigers!). A couple of phone calls were made and “He” cooked a BBQ for tea. In hindsight, we should be heading to Carnarvon Gorge rather than the intended route west to Charleville before heading north again. Sorry to say this to nice people. You really need to edit your stories and correct punctuation or spelling errors. I have read all posts to this point and am frustrated by the number of errors. The errors make the story difficult to read. Your use of the simple word To, Too and TWO are always in the wrong context. Follows is an excerpt of your post with just two (2) errors with correct spelling in brackets.